Bosses have apologised to passengers after a London-bound British Airways flight was delayed by three hours following an incident in which a mobile phone was allegedly thrown from the aircraft on to the runway at Edinburgh Airport. 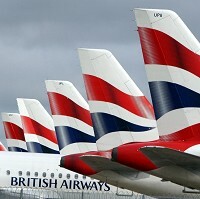 The incident occurred on June 24 around 7:30pm when the BA2945 flight to Gatwick was preparing to take off. Two flight officials - understood to be the captain and co-pilot - were questioned by the police investigating the incident. The disturbance happened after an unclaimed mobile phone was found on board, police said. The delay could lead to travel insurance claims. "We apologise to customers on the BA2945 from Edinburgh to Gatwick for the delay to the aircraft's departure," a BA spokeswoman said. "There was a local airshow in aid of Armed Forces Day that meant some aircraft couldn't depart or arrive for some time. "This was further exacerbated as an unclaimed mobile phone was located on board so the aircraft returned to stand. We are investigating the matter and speaking to the pilots to understand the exact circumstances around the whole incident." Lothian and Borders Police also said a probe was being conducted to establish the full circumstances of the incident.